This Tanning Applicator Mitt, by Tanning Essentials, protects your palms from tanning solution and easily applies your self tanning product to all areas of the body including the back of your hands, ankles, and feet. The velvety soft fabric construction of this mitt helps to glide on the tanning product and ensures no blotching or streaking. This mitt is ideal to use with mousses, lotions and even spray tan products. This patented mitt provides a water-resistant barrier to protect your hands from any possible staining. 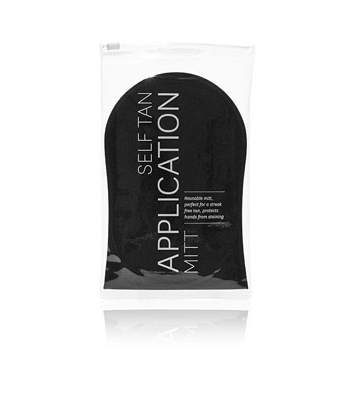 We recommend this mitt to all our customers who use self tanning products, including; mousses, sprays, foams and lotions. This clever little mitt ensures even and streak-free results in half the time, every time. If you don’t have time for a spray tan this really is the next best thing! Washable and reusable, the application mitt is also great for smoothing out excess tanning solution after a spray tan. 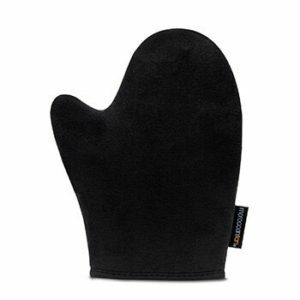 Apply your tanning lotion to entire body using the tanning applicator mitt. Apply only a half strength amount around the elbows, kneels, feet, and hands. Then to tan the face just rub your face with the mitt – without adding any more product to it, just what is left over on the mitt from the body application. 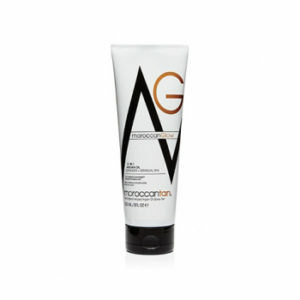 This will give you a lovely sun-kissed look on the face.